The HP 5442 excels at all types of printing, whether that may be documents or images. At some point your HP 5442 will run out of printer ink, and when it finally does happen you'll soon discover that replacement HP 5442 ink tends to be really costly. You don't need to get worried about dishing out the steep asking prices you'll see on the main street because here at Cartridge Save you can get all the HP 5442 cartridges you will need at ultra competitive prices. Save a lot of money on your ink by purchasing online at Cartridge Save! It makes no sense to fork out so much for the 5442 original cartridge or 5442 compatible ink on the main street when it is far more straight forward to save a handful of money ordering with Cartridge Save. You can have full peace of mind when you buy DeskJet 5442 ink cartridges from us because every single one is guaranteed by a straight forward money back guarantee. Don't forget to take into account that each purchase also comes with free delivery, usually arriving at your doorstep the next working day! The HP Deskjet 5442 is a printer which might well have passed you by what with the sheer number of printers available on the market these days. But just because this is a Deskjet printer rather than a Photosmart printer, this doesn't mean for a moment that you should ignore the HP Deskjet 5442 and everything it has to offer because this is one printer which has plenty to offer, even if it is a little bit understated when compared to the competition. Here is a brief review of the HP Deskjet 5442, something which should hopefully help you get a better understanding of its finer features. Design wise, this is a very simple unit. The HP Deskjet 5442 comes in a subtle white finish and this printer is also small and compact enough to fit comfortably into a wide range of spaces and environments. As such, there is nothing bad to be said about the design of the HP Deskjet 5442. 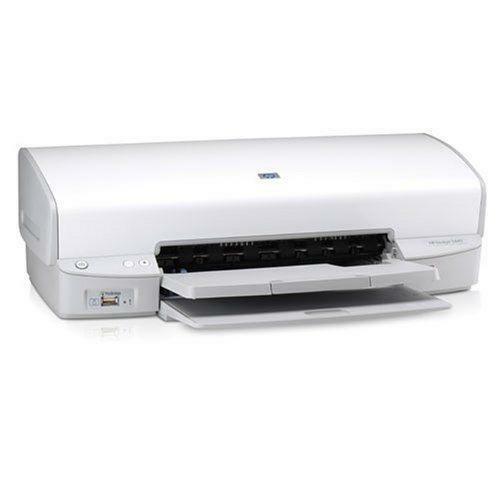 The key advantages of the HP Deskjet 5442 are to be found in the results, and in your pocket. This is a fairly affordable number, and yet the print outs created by the HP Deskjet 5442 are certainly impressive, even more so when you consider that the machine itself is fairly cheap to purchase, and to maintain. There are only a few issues where the Deskjet 5442 is concerned and the key problem, if you could call it such, is the fact that this printer has some limitations. However, for the money you will need to hand over in order to purchase a HP Deskjet 5442, these limitations are to be expected. A fine printer all round.